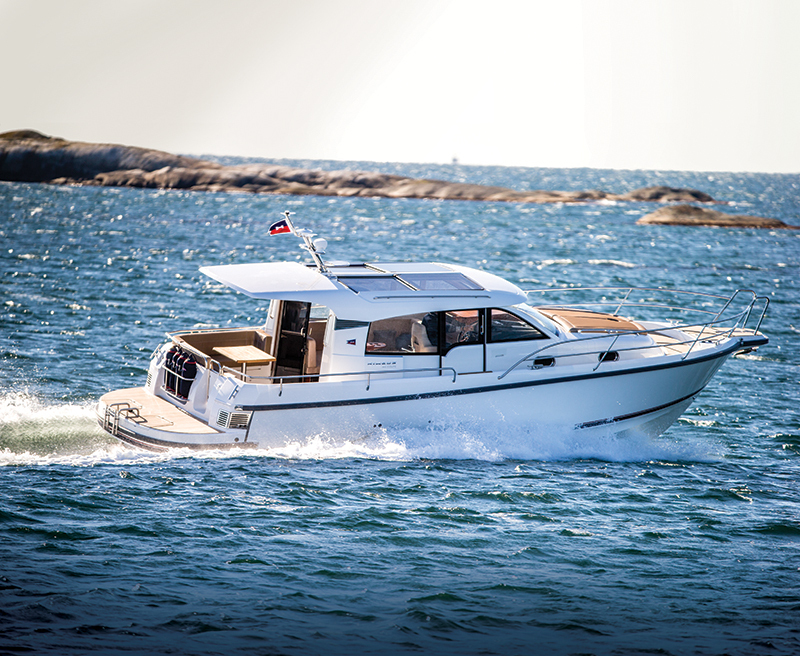 A Swedish builder cooks up a West Coast-worthy family coastal cruiser. One’s first look at the Nimbus 365 Coupe might cause one to take a second look and wonder if his eyes are deceiving him. 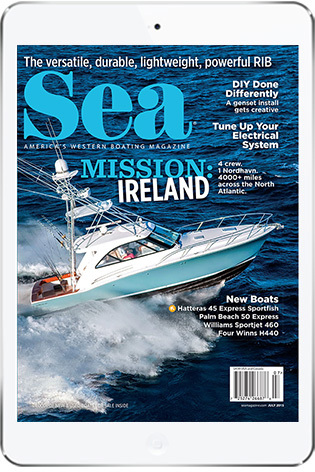 The deckhouse of the boat is offset, to create a wide sidedeck on the starboard side and none to port. Nimbus calls it the side-walk design concept and claims it makes maximum use of the interior space. And to facilitate the captain’s access to the sidedeck and its path forward and aft, Nimbus designers fashioned a flush sliding door next to the helm station. 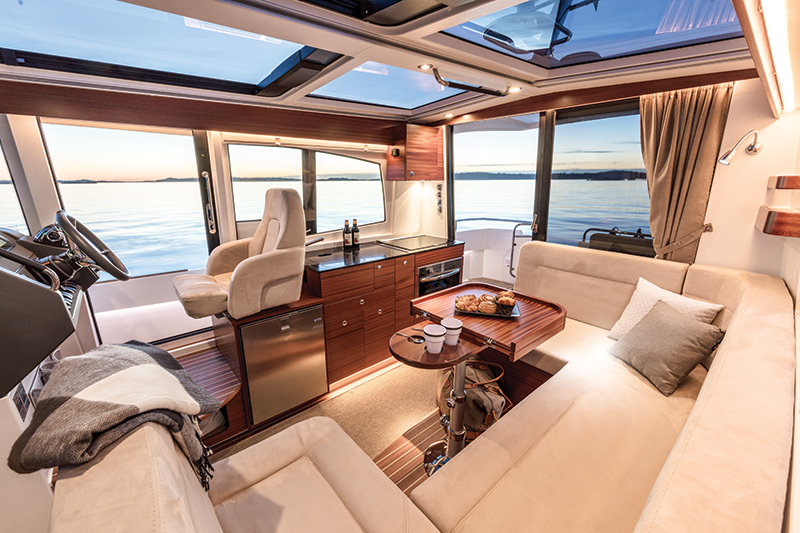 The aft deck is spacious and social, with an L-shaped settee to port with a table. Through a large sliding door is the salon and galley. Windows encircle the deckhouse, so natural light is abundant. Plus, there are windows in the hardtop to allow in even more light. Two of the window panes slide open electrically, lending the interior space an outdoor feel when the weather is right. A C-shaped settee has room for six people and wraps around a dining table. The galley sits to port, immediately aft of the helm chair. 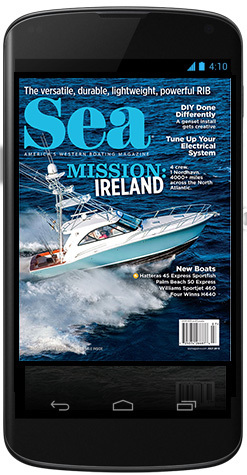 At the helm, the captain has a Simrad NSS evo2 multifunction display at his disposal. 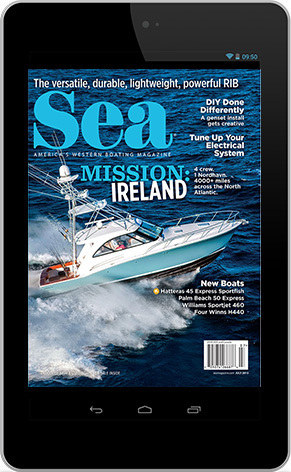 The easy-to-use 12-inch MFD functions as the nerve center of the boat. On the starboard side of the dash is the engine control, which will be a single or a double, depending on the engine package the owner chooses. 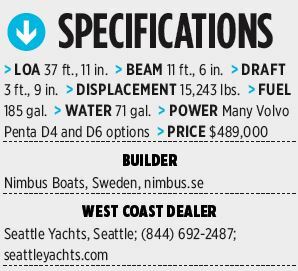 Volvo Penta D4 and D6 diesels — singles of 260, 370 and 435 hp and twins of 225, 260 and 300 hp — power the near-38-footer, delivering a top speed from 22 to 32 knots. Two cabins belowdecks provide sleeping space for four people, and the single head includes a sink, a toilet and a separate shower stall. The Nimbus 365 Coupe checks many family cruising boxes. Its cockpit is large, sociable and fishable, and its hardtop extends over most of the cockpit. The main cabin is bright, well ventilated thanks to the sunroof, and sociable. Belowdecks has room for the parents and a couple of kids to sleep; plus, the dinette can accommodate adaptable sleepers. And the Nimbus literature doesn’t highlight this, but we’re guessing some watersports are possible with the addition of a ski tow bar.